International lawyer Sophie Bellamy has dedicated her life to helping people in war-torn countries. But when she survives a hostage situation, she remembers what matters most - the children she loves back home. Haunted by regrets, she returns to the idyllic Catskills village of Avalon on the shores of Willow Lake, determined to repair the bonds with her family. There Sophie discovers the surprising rewards of small-town life - including an unexpected passion for Noah Shepherd, the local veterinarian. Noah has a healing touch for anything with four legs, but he's never had any luck with women - until Sophie. 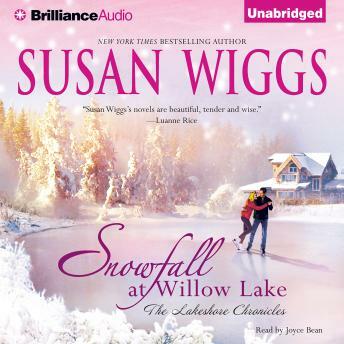 Snowfall at Willow Lake speaks from the heart about all the loves that fill a woman's life, and all the ways that love is tested and made to grow. It's the story of what comes after a woman survives an unspeakable horror and finds her way home, to healing and redemption and a new chance at happiness. I liked this story. The first part of the book had a lot of backstory for Sophie, but I suppose one needs it in order to understand the character and her motivation. I loved all the secondary characters, esp. Sophie's daughter. Sophie almost fell into her HEA in spite of herself. The only bad thing, which has nothing to do with story, was the audio reader. The effected New England accent she gave all the men was horrible and took me out of the story again and again.